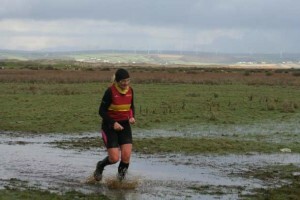 All the rain has at least made for perfect conditions for ORC’s mud lovers of which there a few! New Year’s day saw Rob Hicks, Will Lamerton, Paul Crease, Roger Voaden, Paul Carter, Merv Rice, Stuart May, Anne and John Binns blowing away the cobwebs at the Brown Willy Run where there was as much mud as any mud lover could wish for. Paul, Merv, Stuart and Anne turned out again the next weekend to help make up a record turnout of fourteen members at the Frank Elford Westward Cross Country League’s fourth race of the series at Westward Ho! where there was plenty more mud and lots of deep (very cold!) water. Rob and Claire Kelly, despite the conditions, came along with their two beautiful babies. Rob took charge of the pushchair to watch Claire run in the ladies race, after which Claire calmly took over the parental duties so that Rob could race with the men – pure Class! The fifth race will be at Stover on Sunday 14th February, lets try and get another record turnout! Remember this is free entry as the club has already paid – just make sure to wear your club vest or t-shirt. If you are interested in taking part please let Andy Vallance know. One of a few puddles! Error: Error validating access token: Session has expired on Saturday, 20-Apr-19 03:20:42 PDT. The current time is Monday, 22-Apr-19 11:56:12 PDT.